GOD IS GOOD: A week in the life of a Missionary…. A week in the life of a Missionary…. I’m really sorry this update has taken so long but there always seems to be something exciting going…. so let me tell you about this awesome trip our rehab team did upcountry. It was so good to get out of the city and see some countryside. We went to three different hospitals teaching clinicians how to treat kids with club feet. Ok so our Club foot teaching adventure began after a hectic day at Ola During, which is a local hospital we’ve been teaching at all year. Just picture a tiny room (and when I say tiny I really mean tiny) with up to 10 people in it at a time (and the occasional chicken or rat). Then picture a massive line of patients outside with club feet. Then add in another whole bunch of patients with medical problems varying from Cerebral Palsy to broken arms and legs coming with the hope of us being able to help them. Anyways when you picture all of this and then add in about 35 degrees you start to get the picture of what we do every Wednesday. It’s funny but in amongst the chaos I find myself loving my Wednesdays. So we left after the Wednesday clinic and headed to Bo. The road there is great – nice and smooth so we got there in a few hours and settled into our hotel. Now when I say “hotel” please don’t picture a nice luxury resort or anything like that. Where we stayed was fine but it was located in between two very loud night clubs and Wednesday night in Africa is ladies night (a very popular night for going out and partying), so getting a good night sleep wasn’t the easiest. I managed to get a few hours in between the honking car horns, the loud music and the arguing on the street. The funny thing was that my African friend Mr. Bambino (one of the local clinicians we have been teaching) who was in the same room as me had a perfect nights sleep. I guess practice makes perfect… however I think next time I am going to take some sleeping tablets…. We then took the road (if you can call it that) up to Koidu. The locals actually call this road the “road of judgment”. Just imagine the most turbulent airplane ride you have ever been on and combine it with a six and a half hour fast washing machine cycle and you are getting close. Aside from the bumpy trials and tribulations this leg of the trip was amazing. I really enjoyed it as it’s not everyday you get to travel through untouched beautiful country side. So we made it to Koidu after a long days travel and Koidu is where the diamond mining happens so it has a mining town feel to it… and no I didn’t go mining for diamonds. 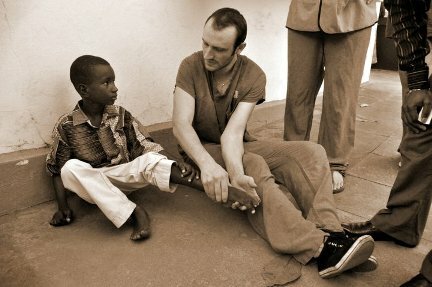 The Club foot clinic there wasn’t very developed so it was really great to teach them the basics and get them started. We head back in a month so it will be great to see how they are doing. We then got back on the bumpy road and headed for Makeni. As we got closer, we found out that the President was in town, and as we had not paid for our rooms in the hotel we were booked into, the booking had been cancelled so that all his entourage could stay there. Therefore, we ended up finding a very basic guesthouse (very basic). Now in Africa there are a few things you should expect when you are staying in a guest house or apartment. You should be prepared to take bucket showers, sleep in a bed that is broken and sleep on sheets that aren’t clean. You should also be prepared to have uninvited guests (like the occasional rat or cockroach) and if your lucky you can avoid getting pink eye – bringing your own pillow case is a good idea which I will do from now on J Oh you should also be prepared to loose some weight because with the amount you sweat it’s impossible not to. Anyways believe it or not I am looking forward to doing it all again pretty soon as our team is doing this trip monthly until the end of the year. Now I realise everyone isn’t called to be a missionary but I am glad I am. Anyways we spent the weekend in Makeni, where Mr. Bambino lives and works as a Prosthetist, so we got to hang out with his family and also watch the amputee football team play, as he has made most of their prosthetic limbs. It was amazing how fast they can get around on their crutches – it was great to watch and then talk with them afterwards. Many of their injuries came from the war so they had amazing stories. We also got to hang out in a nice hotel and go for a swim, and have a shower, which was a treat! The Makeni Ponseti clinic on Monday was much better, so that was encouraging. I would expect it though as Mr. Bambino is a really good teacher. He has employed three amputees there, which is great as there are so many of them that just use begging as a source of income. We headed back on Monday evening, tired, sweaty but happy. Straight back into work on Tuesday so it was a busy trip and definitely a great adventure.